Supersprint products are developed around scientific knowledge. Supersprint designs and builds based on each engines performance characteristics. Because it is actually easier to lose horsepower through misuse of larger diameter tubing and badly designed silencers, exhaust flow rates and velocity are dramatically increased by Supersprint designs while still retaining factory OEM diameter tubes. All design is validated by extensive testing which includes hours of dyno testing on Supersprints exclusive in-house Maha 4-wheel chassis dynamometer. 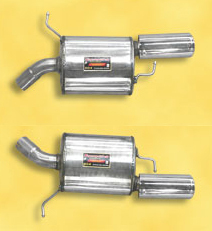 This rear muffler is constructed of 100% stainless steel. All internal tubing, resonators and tail pipes are stainless steel. Packing material is long-strand stainless steel wool and rockwool. These materials are manufactured to Supesprint specs and provide much higher heat resistance than fiberglass. These materials insure a longer lasting system that will not blow out packing due to heat break-down, and tone that retains sound quality for many years. -100mm Dual round tip and required no trimming of the stock rear valence. Note: This product is Left and Right Rear Mufflers only. Exhaust Pipes sold seperately. The final Supersprint product reflects the pride of the entire organization. Each system is manufactured to exact industry leading standards of excellence. When you look at a Supersprint product you can see the attention to detail, the quality materials, precise welds, rather than crimped seams, and the superb finish. It’s obvious Supersprint produces one of the best exhaust system in the world. You can truly see, feel and hear the quality, now and for years to come!